Rivers are the lifelines of Colorado’s economy, environment, and lifestyle. They touch everyone in our state, providing most of our clean, safe, and reliable drinking water; supporting our thriving farms and ranches; and contributing to culture, heritage, and recreation — everything from world-class fishing, paddling, and scenery — drawing visitors from around the world. Colorado’s rivers provide so much to each of us, but do we really know enough about them? In Colorado, most of our rivers begin as melting snowpack. Water runs off the high peaks of the Continental Divide and heads east (Front Range) toward the Atlantic Ocean or west (Western Slope) toward the Pacific. Colorado is a headwaters state and the origin of four major river basins, or watersheds — areas of land that drain through small streams (tributaries) to a common point (main-stem river). Colorado’s basins include the Platte (northern Front Range), the Arkansas (southern Front Range), the Rio Grande (southern Colorado), and the Colorado (western Colorado). Together, these rivers supply water to 17 downstream states and two countries — the United States and Mexico. One of the largest river basins in the state, the Colorado River, begins high in Rocky Mountain National Park, flows west toward Grand Lake, to Kremmling and beyond. This basin includes world-renowned tributary streams and rivers, vital for fishing, whitewater, and agricultural irrigation. Other rivers that make up the Colorado Basin include the Animas, San Juan, Blue, Dolores, Eagle, Gunnison, Roaring Fork, and Yampa rivers. Each flows into the larger (or main-stem) Colorado River on its interstate and binational journey toward the Gulf of California in Mexico. Although rivers like the Colorado sustain our economy and quality of life, our state’s arid and variable climate does not guarantee enough water will be in the right place at the right time for people or wildlife. Any valid water right must meet the following condition, that it is diverted for a “beneficial use;” without waste. That water must also be available for diversion within priority. The definition of “beneficial uses” of water has expanded over time. Recently, “beneficial uses” includes environmental and recreational flows, in addition to traditional uses like agricultural production, and water for cities and towns including drinking water. When Colorado became a state in 1876, the State Constitution recognized the critical need for water to encourage growth and prosperity. For that reason, the State Constitution includes language about taking water out of rivers — often called withdrawals or diversions — stating that “the right to divert” unclaimed waters from “any natural stream for beneficial uses shall never be denied.” The interpretation of “beneficial use” has expanded over time. Today, recognized beneficial uses include leaving water in the river to benefit the environment and recreation — in addition to traditional uses, like growing crops and livestock and supplying water to cities and towns. Colorado allocates the right to use water under what is known as the Prior Appropriation doctrine, also known as “first in time, first in right.” The date when a potential water user (a farm or ranch, for example) files for a water right determines their place in line. Older, more “senior” rights are claimed earlier in time than younger, more “junior” water rights, and senior rights may be satisfied in full before junior right-holders receive any water. The prior appropriation system helps supply water to our homes and irrigate crops on both the Front Range and Western Slope. As Colorado developed, though, the Front Range grew beyond what nearby available water sources could supply. Envisioning a future of water scarcity, Front Range water providers (utilities and conservation districts) secured significant Western Slope water rights, allowing them to pipe and pump Western Slope water east across the Continental Divide to the Front Range. These trans-basin diversions permanently remove water from one basin, depriving downstream ecosystems and communities of water that would have naturally flowed through them. Today, roughly 80 percent of Colorado’s population lives on the Front Range, while about 80 percent of Colorado’s precipitation falls on the Western Slope. The vast network of dams and diversions moving water across the state have altered natural river flows, considerably impacting recreation, wildlife, and aquatic habitat. As a result, Colorado’s rivers are at risk like never before. Our booming population — which topped 5.6 million in 2017 — has stretched existing water supplies on both the Front Range and the Western Slope. Officials estimate that the state’s population could nearly double in 30 years. Much of this growth will occur on the Front Range, and El Paso, Arapahoe, and Adams counties will likely have higher populations than Denver County by 2050. Colorado’s rivers are already overworked to meet current demands, let alone provide for future growth. At the same time, evidence is mounting that rising temperatures and drought are reducing snowpack in the Rockies. The rate of warming in the last century alone was higher than in the last thousand years. Reduced snowpack and increasing dust-on-snow events (dirty-looking snow that absorbs more sunlight and melts more rapidly resulting in a faster spring snowmelt) are also altering the timing of snowmelt for rivers. So on average, snowmelt runoff, which is when our rivers reach their highest level, is occurring earlier across most of the West. Even with Colorado’s high mountains and cold snowpack, snowmelt timing here has advanced by about two or more weeks since the late 1970s. Timing of runoff is very important to fish and aquatic health, river recreation, and the amount of water available for human needs. As drought grows more common, Colorado’s hardworking rivers will need our help to withstand the increasing strain. The state of Colorado recognized the looming threats facing our rivers and water. To better manage finite water resources and establish a sustainable path towards water security, Governor John Hickenlooper ordered the Colorado Water Conservation Board, a state agency, to work with citizens and stakeholders across the state to develop a blueprint to guide us in the right direction. After two drafts and input from over 30,000 Coloradans, the governor signed Colorado’s first Water Plan in November 2015. Priorities include improving access to and availability of clean drinking water, increasing action around water conservation in cities, improving vital river and watershed protection and supporting flexible water policies that help bolster agriculture. Communities across Colorado, along with state agencies and local water providers, are improving how they protect healthy rivers and water supplies. In addition to implementing the water plan, communities are taking it upon themselves to conserve critical headwater lands, finding ways to keep water in rivers, and securing open space for wildlife. All of these are positive steps toward a more secure water future for people and the environment. As a semi-arid state, Colorado is heavily dependent on the water flowing through its rivers and streams. As Colorado developed, the Front Range grew beyond what nearby available water sources could supply. People settled where they choose to, not necessarily where the water is found — About 80 percent of Colorado’s population lives on the Front Range, while 80 percent of Colorado’s precipitation falls on the Western Slope. Envisioning a future of water scarcity, Front Range water providers (utilities and conservation districts) secured significant Western Slope water rights, allowing them to move water from the Western Slope across the Continental Divide, east to the Front Range. But once water is diverted through a “trans-mountain” diversion, from the Colorado River Basin east to a different basin, like the South Platte or Arkansas River Basin, it never returns to the Colorado River. · Small ditches and canals, pipelines, larger tunnels, reservoirs and many natural rivers act like plumbing to move water from one location (or one watershed) to another. Often the most efficient way to move water in Colorado, tunnels are large in diameter, long in length and lose very little water to evaporation while they transport water from one place to another. · Pipelines are often closed, above-ground systems that, like tunnels, also limit evaporation and reliably deliver water from one point to another. Traditionally, tunnels and pipelines use gravity to move water, but when water must move uphill, people rely on various types of pumps to do the job. · Reservoirs collect water from rivers, tunnels, and pipelines for future use on both sides of the Continental Divide. Reservoirs don’t “make” water, they simply store it. Generally created by the damming of a river, reservoirs are man-made lakes that vary in size and purpose. In addition to storing water for drinking or agricultural use, reservoirs can also provide popular recreation areas and habitat for birds and fish, and many reservoirs allow for the generation of hydropower. Reservoirs are very common in Colorado with hundreds of small reservoirs — and nearly 40 large reservoirs — across the state. - Acre foot: One acre-foot equals about 326,000 gallons, or enough to cover an acre of land — about the size of a football field — with 1 foot of water. An average household uses about one-third of an acre foot of water per year for indoor and outdoor use. Cubic feet per second (CFS): Cubic feet per second is a way to quantify the amount of water flowing downhill. One cubic foot per second, or 1 CFS, means that it takes 1 cubic foot of water 1 second to flow by a set point. Compare it to one basketball of water flowing past a single point every second. · Dams that create a reservoir vary greatly in size. Some are hundreds of feet tall, while others are barely a few feet high. Dams hold back the water of a river for storage, or in some cases, simply re-direct water into a tunnel or pipeline; this is called a diversion dam. Dams that generate hydropower direct water through a penstock pipe that turns a turbine, and then move water back into the river below. In Colorado today, over 60 operating hydropower dams generate a total capacity of 1,150 megawatts. · Lined and unlined canals or ditches transport diverted water from one place to another. Because, just like rivers and streams, they are open to the air, these systems lose water either through evaporation or seepage, unless they are lined with concrete or steel to stop seepage into the ground below. Historically, and still common today, farmers and ranchers use canals and ditches to move water from one area to another. · Rivers and streams on the Front Range, like the South Platte, Cache La Poudre, Boulder Creek and tributaries of Clear Creek, can act as natural conduits for Western Slope water. Often, diverted Western Slope water is delivered to Front Range river via a reservoir, tunnel, pipeline or canal before flowing downstream. For instance, water from the Blue River is stored in Dillon Reservoir on the Western Slope before moving through Roberts Tunnel into the North Fork of the South Platte on its journey to Denver. 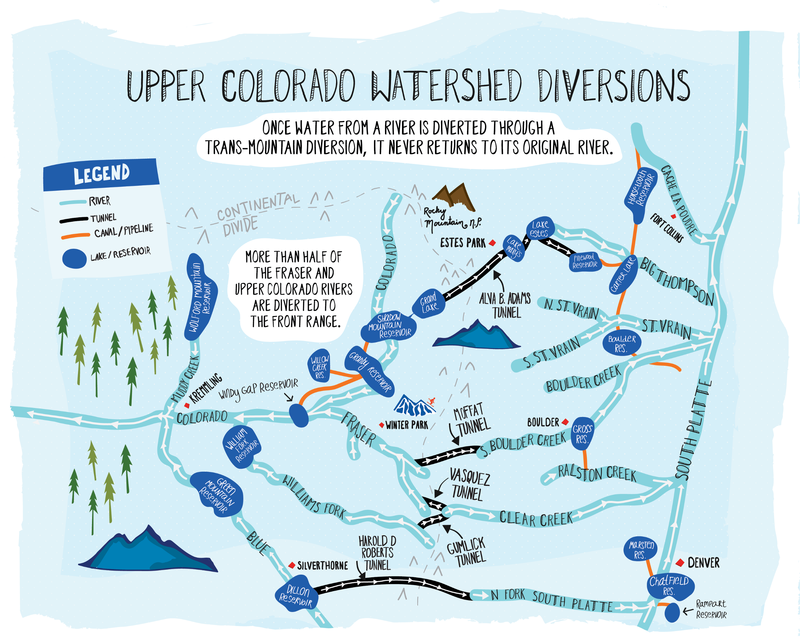 One of Denver Water’s diversions moves Upper Colorado River water from the Fraser River through the Continental Divide by way of the Moffat Tunnel, then down South Boulder Creek to be stored in Gross Reservoir, near Boulder. (Denver now wants to expand Gross Reservoir, something conservation organizations included in 1983 in a package of acceptable alternatives to the massive Two Forks Dam. Two Forks that would have flooded a gold-medal fishery in Waterton Canyon west of Denver, and EPA eventually blocked it. **) The water then leaves the reservoir, flowing through pipes to a water treatment plant before reaching taps in Metro Denver. River diversions that move water across the landscape have been pivotal to the growth and prosperity of Colorado, providing clean, reliable drinking water to our growing population, and supporting agriculture, municipalities, and industry. However, the hardworking rivers of Colorado have given more than they can sustain, and even greater demand for water is on the horizon. Heavily overdrawn rivers, particularly the headwaters of the Colorado River, are struggling because they don’t have enough water to flush sediment downriver or sustain river habitats. New large trans-mountain diversions no longer make sense for Colorado, because they further endanger Western Slope communities and the rivers we all depend upon. Colorado must make a financial commitment to greater water conservation, reuse, and efficiency in cities, towns, and agriculture, while looking for innovative solutions to share water between users who have the water, and others who may need it, all while considering the health of the rivers themselves. Colorado is going to grow, and we can’t continue with the traditional thinking that the water will just “be there.” Too much is at stake for our rivers, for our communities, and for our future as Coloradans to not work together to encourage more conservation, as well as enable greater flexibility, when considering our water future. For many communities along the Front Range, when you turn on the tap, a mixture of water from both Front Range and Western Slope rivers pours out. Diverted river water travels through a series of tunnels, pipelines, and canals destined for storage in a local reservoir. When demand for public drinking water arises, water is transported from the reservoir to a water-treatment plant, where it is treated to meet both federal and state standards for drinking water. Then, the “finished” water is pumped through a series of storage tanks and lift stations to eventually reach individual homes and businesses in the community. Each water provider has hundreds, if not thousands, of miles of underground pipes that deliver water to your community. Five major water utilities supply Front Range communities with municipal, agricultural, and industrial water: Aurora Water, Colorado Springs Utilities, Denver Water, Northern Water, and Pueblo Board of Water Works. They all use similar means to transport water from west to east, including tunnels, pipelines, reservoirs, dams, canals and, of course, nature’s best transport systems: rivers themselves. The major differences between utilities largely depends on the size of their territory and the number of people who pay for their services. Denver Water serves almost one-quarter of the state’s population, so its supply of water and its facilities, reservoirs, diversions and pipelines are much larger and more complex than those of a smaller utility like Pueblo Water Works. The amount of conservation, efficiency and reuse strategies also differ from one utility to another. 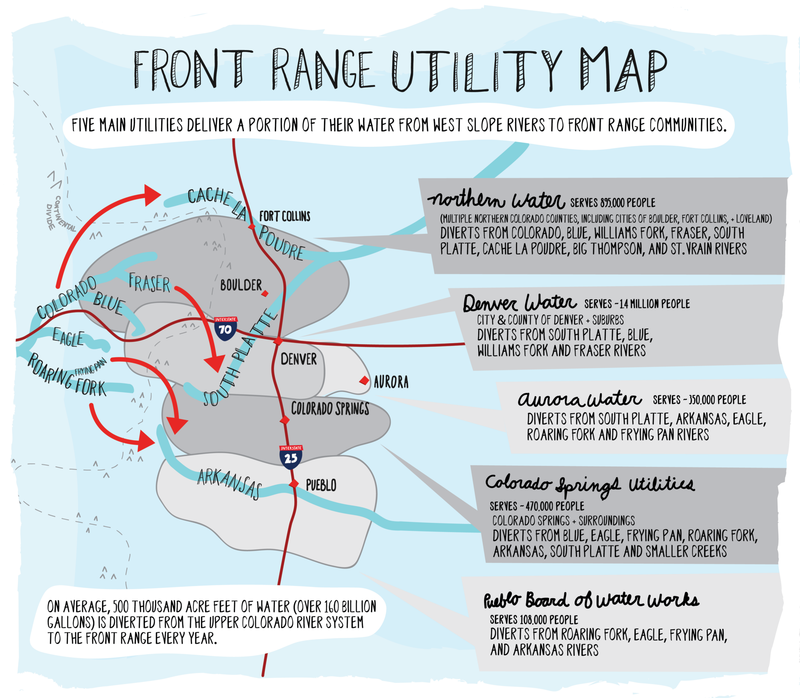 The Front Range’s Five Major Water Utilities Deliver a Portion of Their Water from the Western Slope, Diverting, On Average, 500 Thousand Acre Feet of Water Every Year. But like everything, pipes and tanks age over time. Many such systems reach the end of their lifespan after about 75 years. Across the country, communities are dealing with the challenges of water-line breaks and leaky pipes. In some communities, as much as 25 percent of treated water is lost through leaky pipes. After you fill up your glass, take a shower or flush your toilet, that dirty water, or wastewater, is sent through special pipes to a wastewater treatment plant. On the Front Range, the Metro Wastewater Reclamation District treats wastewater for much of the Denver Metro area, collecting approximately 130 million gallons of wastewater per day from neighborhood sewer lines. At the wastewater treatment plant, a complex series of ponds, filters and helpful bacteria clean the water and remove over 95 percent of pollutants. Traditionally, once wastewater is treated to required standards, it is discharged back into the local river system, such as the South Platte in Denver. Once back in the river, the water can then be reused for agriculture, industrial use, and by downstream communities, or it can be left in the stream to support aquatic life and recreation. The second option is to purposely recycle the water for more immediate use. Recycled water undergoes an additional treatment process to remove contaminants. After this final treatment, recycled water is then distributed through a separate set of pipes to industrial, commercial, and people like you who irrigate your outdoor space. This recycled water reduces the need to use drinkable water for outdoor purposes. You can recognize these pipes because they’re always light purple. Between common discharge, water recycling, and naturally returning water to rivers, water in Colorado is typically used six times, or more, before leaving the state. That’s hardworking water! Aurora Water developed the Prairie Waters project as an innovative way to provide drought insurance and a long-term supply of water for the city. Prairie Waters uses both natural cleansing processes and state-of-the-art purification technology to deliver up to 12 million gallons per day to Aurora Water. Twenty-three wells pull wastewater through hundreds of feet of sand and gravel to remove impurities. After that, the water is pumped into enormous bowls where it percolates through more sand and gravel over a longer period of time. From there, a pipeline carries the water to three different pump stations before ultimately making its way to a treatment plant located near Aurora Reservoir. 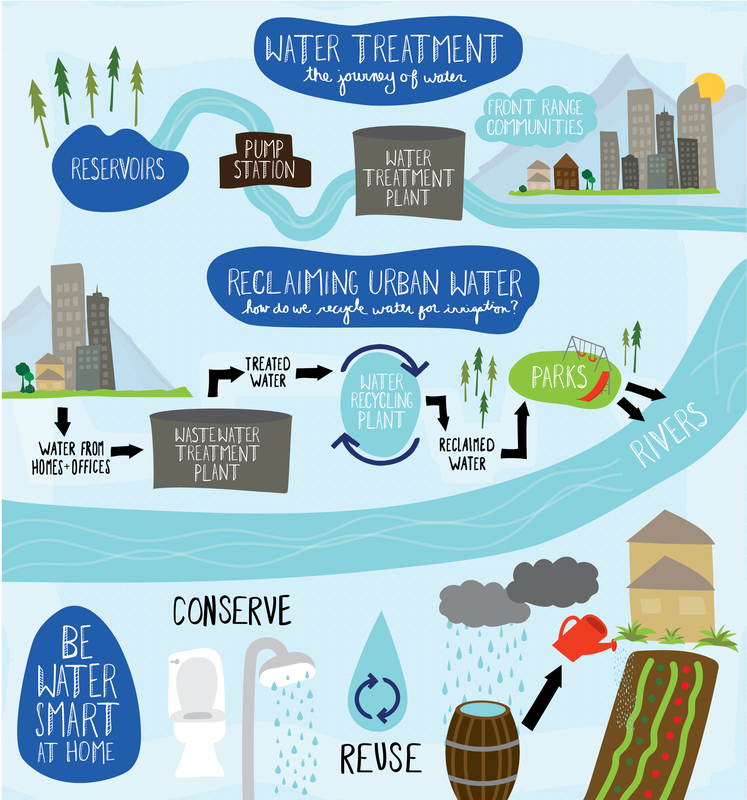 As the need for new water supplies continues to grow, using more recycled water for industrial, commercial, and outdoor irrigation reduces the need to take more water out of rivers. Denver Water is building the largest recycling water system in Colorado. When construction of the water recycling system is completed, it will free up enough drinking water to serve nearly 43,000 households. Communities across Colorado have pledged to improve conservation measures by seeking efficiencies, investing in reuse and recycling, and encouraging smarter growth. In Colorado, outdoor irrigation accounts for more than half of municipal water use, and there are a number of simple things you can do at home to reduce your water use: turn off the tap when it’s not in use, take shorter showers, and reduce the amount of time you water outdoors. To significantly reduce your water footprint, plant low-water plants and shrubs, remove grass altogether, and capture rain in a rain barrel. Water ties our state together, but managing water in Colorado has never been easy. With a changing climate, growing population, and numerous competing needs for water, managing Colorado’s water will not get any less challenging in the future. Utilities, communities, and the state are doing a better job of preserving Colorado’s rivers, while securing clean, safe, reliable drinking water. 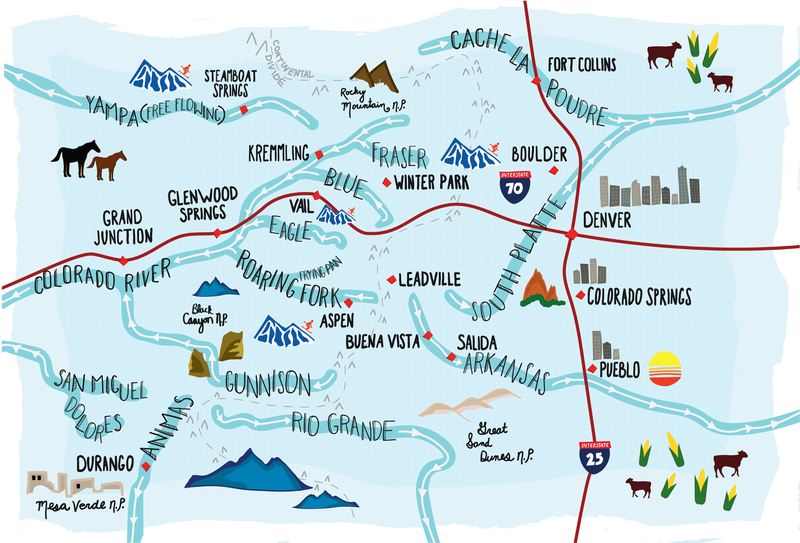 Colorado’s Water Plan offers solutions to water uncertainty by charting a collaborative path forward towards water security for people and the environment. The Plan provides a blueprint for improving water conservation, using land smartly, storing and sharing water more efficiently, and making sure that our rivers and natural places have the water they need to stay healthy and to support Colorado’s vibrant recreation economy and way of life. It is now up to Colorado to put the Water Plan into meaningful action. The problem is that the state isn’t sure how it will pay for some of the most critical priorities for maintaining and improving our rivers. Traditional water infrastructure projects, such as reservoirs and diversions, generally require several funding options for construction. Rivers and streams do not. We must commit to funding, and action, for sensible conservation projects instead of large trans-mountain diversions that endanger Western Slope rivers, agriculture, and rural communities. Coloradans know what makes our state so great: our rivers. We must meet future water demands without sacrificing our rivers — and the wildlife, communities and economies they support. Our communities, economies, environment and drinking water depend on all of us working together. Can our rivers count on you to help move Colorado’s water future forward? **Note: Based on multiple sources, Gross Reservoir enlargement was part of the alternative to Two Forks. Denver Water had a water right, but not a permit, to enlarge Gross Reservoir already. When Denver did not get a permit to build Two Forks, it was agreed to build the Moffat expansion, and also increase conservation efforts, and some additional withdrawal of Denver-area groundwater. “Do You Know Your Water, Colorado?” was written by Fay Augustyn, Conservation Director with American Rivers with help from Abby Burk, Western Rivers Program Manager for Audubon Rockies. Images were designed by Margo Stoney, High Mountain Creative. Additional support for “Do You Know Your Water, Colorado?” was provided by American Rivers (Katy Neusteter, Ken Neubecker, Matt Rice, and Sinjin Eberle), BerlinRosen Public Affairs, The Nature Conservancy (Aaron Citron), Western Resource Advocates (Bart Miller, Drew Beckwith, and Rob Harris), and Water for Colorado (Sue Brown and Lauren Bogard). Stories about protecting and restoring our nation’s rivers and streams. How will you get involved?